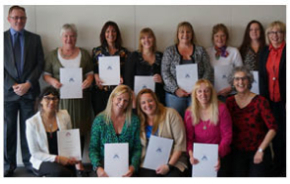 Shelter Tas would like to congratulate all the Social Housing students for graduating and receiving their Certficate IV in Social Housing and Diploma of Social Housing units. Pictured with Lynden Pennicott from Housing TAS and Pattie Chugg from Shelter TAS. National Shelter will continue to advocate for vulnerable people and a better housing system, despite the Commonwealth Government’s decision to withdraw funding from peak and advocacy bodies including National Shelter, Homelessness Australia and the Community Housing Federation of Australia (CHFA) as of 30 June 2015. The National Shelter Council Meeting in Brisbane on 30 and 31 March 2015 resolved to continue operations using their current structure until at least December 2016. This extension of the work program and staffing arrangements beyond the funded period will rely on the successful pursuit of a fundraising and sustainability strategy. • Innovative and practical policy responses in housing affordability, drawing on a coalition of housing peaks from both the community and private sectors. If you are interested in partnering on any of these projects, please contact Adrian Pisarski via emailadrian.pisarski@shelter.org.au or phone 0417 975 270. The Your Human Services Progress Chart provides a wide range of information about the performance of Tasmania’s human services system. The report found that the public housing wait list has increased from last year. The wait list at 31 December 2014 was 2,948, an increase of 43.5% compared to the previous year. The period coincided with the introduction of the new housing help system ‘Housing Connect’, which may have encouraged more people to seek assistance, as it provides a portal for all enquiries in relation to housing including private rentals. Housing Tas is seeking feedback on the Affordable Housing Strategy Draft Recommendations. The survey will take between 15 to 30 minutes to complete depending on the amount of feedback you wish to give. Click hereto begin the survey, comments are requested by Wednesday 6th May. The National Housing Conference 2015 is now calling for abstracts. This is your opportunity to share your work and actively participate in the conference program. The submission deadline is Friday 15 May 2015 and places for abstracts in the program are limited. To view the draft program timetableclick here. The conference will be held in Perth from Wednesday 28th October to Friday 30th October. What does a future Australian city look like? To find out more about the submission process, learn about the conference experience streams, or to submit your abstract, visit the Call for abstracts page. For all other conference details, visitwww.nhc.edu.au. Our new website is finally here! We hope you find it informative and easy to use. There are still some improvements to come (such as great document sharing options) and the inevitable technical issues to resolve, so please let us know if you come across any problems so we can fix them up as soon as possible. If there is a document on our old website which has not yet been transferred across to the archive, please let us know and we can forward it to you. Go to www.sheltertas.org.au. Domestic and family violence is the number one reason why people present to specialist homelessness services, with 55% of female clients citing this reason; a total of 25% of all clients. Source: Homelessness Australia (2013), Homelessness and Women fact sheet, Homelessness Australia. Cited in Anglicare Australia, 2015, Anglicare Australia Rental Affordability Snapshot, Canberra. Minister for Human Services, Friday 1 May 2015. Click here. National Shelter, Thursday 30 April 2015. Click here. Minister for Human Services, Monday 27 April 2015. Click here. ABC News, 21 April 2015. Click here. ABC Lateline, 23 April 2015. Click here. The Examiner, 21 April 2015. Click here. ABC News, 28 April 2015. Click here. HousingWORKS, March 2015. Click here. The Conversation, 29 April 2015. Click here. Australian Policy Online, 27 April 2015. Click here. Australian Ageing Agenda, 24 April 2015. Click here. Pro Bono Australia, 21 April 2015. Click here. National Day to Remember Candle Lighting Ceremonies will be held in Hobart and Launceston on Wednesday 6th May 2015. The Hobart service will be held at 5:30pm at Frankiln Square, Macquarie St. The Launceston service will be held between 6pm – 7pm at Princes Park, Charles St. The annual vigil is held in memory of those that have died as a result of domestic and family violence. White Ribbon Australia will host a series of regional forums across Australia showcasing a whole of society, whole of community approach to long term change in the prevention of violence against women. The Hobart forum will be held on Monday 25th May at C3 Convention Centre, Anglesea St, South Hobart. To purchase tickets click here. The Practice, Service, System & Community Transformation Conference is for people living with mental illness, families, friends, community groups, community members, service providers and policy makers. It will be an opportunity for people from all walks of life and support areas with broad experiences to come together to consider and contribute to ‘how we can be the best we can be’. The conference will be held from Monday 15th June to Wednesday 17th June 2015 at the Tailrace Centre, Riverside, Launceston. Registrations are required and will be opening soon. For more information contact Partners in Recovery Tasmania 1300 827 747 or email info@pirtasmania.com.au. The TasCOSS State Budget Briefing will follow the Budget Lock-Up at 4:30pm on Thursday 28th May 2015 in Hobart. TasCOSS staff will provide an immediate analysis followed by a presentation and Q&A with The Hon Jacquie Petrusma, Minister for Human Services. To register click here. Housing Choices Tasmania is running an eight-week Building Confidence and Budgeting Program workshop starting Tuesday 12th May 2015 at Ulverstone Neighbourhood House, 8/10 Lugana Crescent, West Ulverstone. Saving on everyday living costs. Find out more or contact Kathryn at Housing Choices Tasmania 1300 312 447 to RSVP. Presented by Angela Esnouf, from Creating Order from Chaos, and Wendy Hanes CPO-CD, from Skeletons in the Closet, this course is for everyone who works with people who hoard. RSVP by Wednesday 6th May 2015 to Maria Belfrage on 6333 3082 or email m.belfrage@anglicare-tas.org.au or 1800 243 232. The Financial Literacy Australia (FLA) Grants Program supports not-for-profit organisations to advance financial literacy in Australia. In 2015, FLA expects to allocate up to $1.4 million in grants. Expressions of Interest close on Friday 29th May. Click here for more information. The Organising Committee for the Aged and Community Services (ACST) State Conference 2015 invites you to submit an Expression of Interest to present a paper or short presentation at the conference to be held on the 19th and 20th November at the Country Club Casino, Launceston. The theme of the conference is “Reform and Reality – exploring the theory and the real outcomes of system change”. Expressions of interest close on Friday 29th May 2015. For more information click here. Copyright © 2015 Shelter Tasmania Inc., All rights reserved. This eNews has been sent to you because you have indicated that you are interested in receiving updates and information from Shelter Tas.Thanks to all contributors for their submissions and feedback to the eNews. As content comes from many different sources, views expressed are not necessarily those of Shelter Tas. We welcome your input to the eNews – please send suggestions or articles to comm@sheltertas.org.au for consideration. Shelter Tas is supported by the Department of Health and Human Services.